Don't read too much into this but Australian blokes seem to be obsessed with having the biggest of everything. The current Jeep advertisements attest to this. Not only do the boys have to have the biggest Jeep, but the 5yr old has already been indoctrinated into believing that the Jeep automatically has to be accompanied by a bigger boat. I am not going to linger too long on this point for fear of alienating 50% of the population but having the biggest is obviously better (than what you can do with it) and if you have a girlfriend with the biggest 'puppies' you are a real man that everyone will envy. It seems that this desire for the biggest whatevers is also prevalent in the architectural field. I note that on a list of the world's most iconic man-made structures that India has the Taj Mahal, Egypt the pyramids, China the great wall, France the Eiffel Tower and England has Big Ben. We have the bloody big banana… with free sampling of everything banana! Australia must have the biggest list of big things anywhere. Every state in Australia has at least one big structure and all told we have over 150 structure of such greatness. We are obsessed with making the biggest structures. Our big novelty structures are iconic. At least we'd like to think so! You'll be pleased to know I am not going to list them all here but I have done an Australiana Search for biggest structures in size, popularity and uniqueness. Some are totally understandable and reflect the area where they are located but some defy logic. This is a list of some that tickle my fancy and are good for a big belly laugh. Noteworthy for sure is The Big Bottle of Cabernet Sauvignon nestled in the Mangrove Mountains, New South Wales. For some reason that also have The Big Wine Cask… not quite as classy but perhaps more representation of the Aussie culture. The Big Axe breaks the pattern; it's also in NSW. I'm assuming it's in woodcutters' country but I'm not going out of my way to check that one out. You don't have to finish the cask! I was a bit disappointed to find out that the first big structure in Australia was The Big Scotsman (built in the 1960s). The Big Captain Cook I understand (QLD), The Big Gold Panner has a definite Aussie ring (NSW), the Big Ned Kelly in Glenrowan Vic – makes sense. QLD has The Big Stubbie... surely an essential Australian icon. This is no doubt as important as tomato sauce is to the meat pie. Conspicuous by its absence…there is no Big Aboriginal elder. The Big Cheese is an icon after my own heart. I personally try to incorporate this pure cholesterol into every meal. Where else would you find it than Bega, NSW? Predictably Tamworth NSW has The Big Golden Guitar. I am judgmental of the Big $90,000 Gumboot, I think a thong would have suited QLD better. The Big DNA in Perth, really? What's that all about? I guess it's not surprising that we have so many big things you can eat. We are after all the second largest nation (in belt size) in the world. It seems we particularly like big fruit structures. Here's some of the well and less known ones. Everyone knows The Big Pineapple in Qld, right? They have a market and music festival. They also have The Big Apple and The Big Mandarin. Not to be beaten by their neighbouring state, you can find The Big Cherries in NSW. There are three Big Oranges (one in Qld of course, one in SA and another in WA). What's so good about oranges that everyone wants them? A Big Mango is right up my alley. It drew a great deal of attention when it was stolen early in 2014. To top it off Bilpin NSW has the whole flippin' fruit salad… The Big Fruit Bowl … big in door sales perhaps. Australia also has many, many big animals. For personal reasons I decided not to include the Big Spider or the Big Mosquito in this review. Without having visited the states and territories concerned it tells you a lot about the place. Guess where The Big buffalo, The Big Croc, The Big Bull, The Big Cassowary and The Big Crab are? Here's a clue… they are in the North. 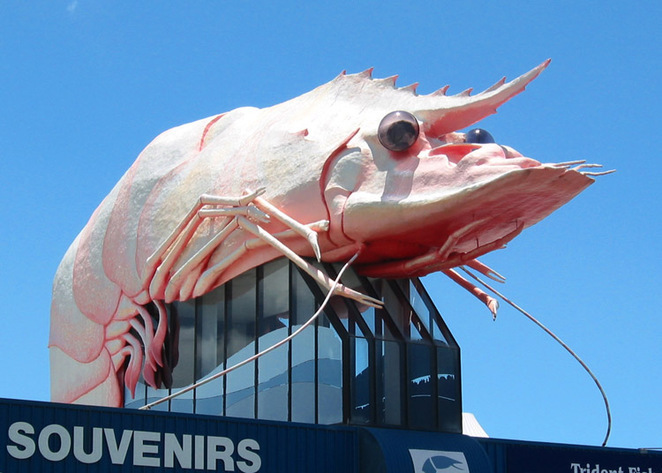 The Big Chook, The Big Prawn, The Big Trout and The Big Merino are all in NSW. They're pretty big on big icons. The Big Lobster and The Big Galah are in SA … apologies to South Australians but I think that says something. 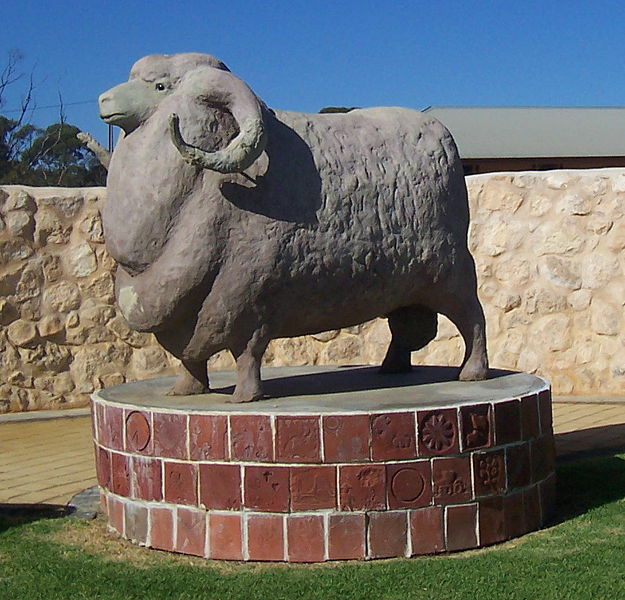 I laughed out loud when I read that Wagin, WA has The Big Ram. That'd be right. I am almost too embarrassed to say that in Vic we have The Big Earthworm… but it is honestly really good, if you like that sort of thing. I am sorry to say that little Tasi, the bit that broke off, is unencumbered by such bigness. They do have one in Mole Creek… you guessed it… The Big Tassie Devil. It's almost enough to put you off entering the wildlife park. I didn't forget about the ACT but I am afraid they have few big things unless you include our pollies. They do have a Giant Mushroom. Apparently, despite the obvious connection to a popular saying, this is not related to the politicians. Ironically they do have Cockington Green Gardens. This is a well-visited miniature village. Read into that what you like. Please don't feel offended that if missed the big thing in your state that you are proud of. Please add a comment if you think others might enjoy it. Most of these big structures are tourist locations and they are usually found on main roads. They are great for family photo backdrops but they serve other devious economic and social purposes. They are part of the great Aussie landscape that sets children up buying up big. As a parent you know that if they spot one of these icons you will inevitably have to have a big wallet or look small in your children's eyes. Grin and bear it… it's the Aussie way. The crocodile and ram are my favourite. What about the bog orange in the Riverland??? Hey Jeni, love the article. A few BIG Aboriginal sculptures for you! The NT BIG Anmatjere Man and WA have the Dream time Statues in Wyndham. I believe WA, sorry, forgotten which town, installed a HUGE Aboriginal bust of an aboriginal elders head in the last 6 months as well. Fun article! I've been to the big pineapple (love that you can climb it and get a lookout! ), and to the big guitar in Tamworth. I agree about the ridiculous cost of a big gumboot... imagine what could be done at schools or in healthcare with nearly $100,000?! Hi Jeni, great article. The $90K Gumboot is because Tully has the most rainfall of any city in Australia. In fact I knew people who lived up there and they had given up trying to clean the mildrew off their walls because the wet just keeps coming back. Tully is in far north Queensland and is right in the line of all cyclones and heavy rainfalls. I'd hate to live there. It's also a sugar cane area. Thanks for the lengthy reply. How could I neglect the big penguin?! Soooo many great big things! you are right, there are so many "bigs" in australia. my childen get excited when they see the bigs. especially the merino in goulburn. glad to see people still get out and about, in this technological society.